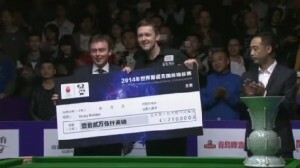 When it was first announced that World Snooker would move away from the traditional tiered format of events a couple of years ago, the concern amongst some was that it could lead to a situation where big names might crash out of tournaments at the qualifying stages, resulting in venues and broadcasters being left without their big names. 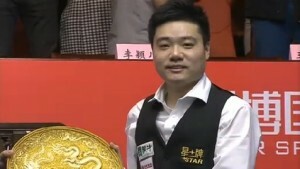 During 2013/14, this did not come to pass to any great extent, but already part-way into the following season, we have seen Ding Junhui miss out on both his home event at the Wuxi Classic, as well as the International Championship where he was defending champion, while world champion Mark Selby and Liang Wenbo were other high profile absentees at the Chengdu event. This month’s Snooker Scene reports that the 2015 China Open last 128 matches of Ding, Selby and 2 more Chinese will be held over to Beijing. It is a move that alongside the fact that three full-ranking events have not yet converted to a flat 128 format, arguably represents if not a u-turn, then a deviation from the policy aimed to promote fairness and give every player the same opportunity, at the expense of guaranteeing the appearance of top ranked players at venues for the benefit of TV broadcasters. 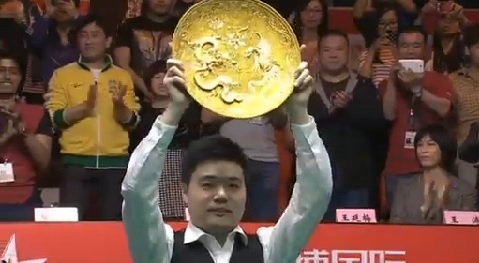 Clearly then, there are strong views on this news amongst some of snooker’s professionals and I can understand why, given the quotes that came from Barry Hearn prior to the introduction of the flat draw format 18 months ago. It is interesting though to look back at my detailed analysis of this issue following the initial announcement in February 2013, when I considered the issue of held over matches as raised at the time by Mark Williams, together with quotes from Hearn and also WPBSA Chairman Jason Ferguson at the time. 18 months on, this is exactly what has come to pass and in particular given the results involving the likes of Ding and Selby so far this season, it is not too surprising to see that World Snooker have reacted in this way. While there will be legitimate questions raised of the fairness or otherwise of the decision to hold over particular matches to the venue stages of events, I can’t help but feel that from a commercial perspective at least, the decision to hold over matches is one that makes sense and it is probably safe to assume that broadcasters in Beijing were keen to avoid another premature exit for their number one player..
As some have suggested, does this mean that we are now going round in circles, with a return to matches being held over to venues as we have seen on many occasions in the past for overseas events? For me that would be an overstatement. Tournaments will still be played under a flat 128 format and the amount of matches that each player will be required to win in order to lift the title will be the same, as opposed to under the tiered structure. But for those players who will see their matches held over, there will clearly be an advantage, which as Mark Williams points out will only be eradicated with all 128 players beginning at the venue, as in York at the UK Championship for example. Players losing in the last 128 of a tournament receives no money. so if a last 128 Match featuring Ding Junhui vs Oliver Brown is carried over to China Ding obviously can afford that trip but Oliver Brown with a threat of having no money couldn’t. some players could be fasttracked to the tour, visas is a bummer too.Iran would probably have 6-8 pros on the tour in four years time if they got the chance to play.Fact right now is that there are not 144 players with pro statues, not even 96, 64 is probably the right number. Another point, shouldn’t Iran players have matches held over in asian tournaments, since they are not allowed into UK?? I don’t really understand all the complaining about matches being held over. It’s not unfair at all from a sports point of view. Still the same number of matches to be played to win, same number of opponents to be beaten for everyone. It’s just a way of acknowledging the importance of top players. They don’t get an advantage in a sports sense, but in a commercial sense, which is absolutely fine. If you oppose holding matches over, you should also oppose the Masters, CoC, probably World Grand Prix, …basically all invitational events. I’m not really adding a lot to the debate, I apologise, but that last tweet from Hearn, really annoyed me. He’s such an arrogant, egotist, he’s not good for the game at all. The early period of the Hearn revolution is starting to unravel. Whilst Hearn came in with lots of promises to make the game more even the “commercial reality” has hit home to him that in a competitive world TV and media only want “stars”. They don’t want to see people developing into future stars as the watching public have only an interest in players at the top end. So from the Masters, we now have the Champion of Champions, Grand Prix, Shootout, Champions League all restricted to a small number of players. The removal of PTC events and transferring all to mainland Europe as well as the removal of an Asian event has also reduced the earnings potential this season. The tiered draws in 3 events and now the holding over of certain matches is another blow to the lower ranked players. Plus of course the problem for non British players of having to travel to the UK to play qualifiers for an event, often in their own country. Do they receive £2,000 in these cases? No mention has been made of this happening. The introduction of a wildcard system to maintain Davis’s interest in the game is also another minor issue introduced. The problems are increasing for Hearn and he faces a battle to continue the advancement of the game for all players. Cheers for the comments guys, appreciate the feedback/debate. One advantage for a lower-ranked player who manages to win in one of these held-over matches would that he would avoid potentially having to play in the wildcard round since the draw for the wildcards needs to take place before the venue stages start.